"I drink and I know things." The use of wild plants to produce alcohol or add flavors to alcoholic beverages goes back into prehistoric times. These are the books I recommend to help you tap your inner cave bartender! #1 is definitely Pascal Baudar's The Wildcrafting Brewer. This is pretty much the bible of all things wild and fermented, from where to get your wild yeasts, what plants to combine with these yeasts to create alcohol, and how to blend the flavors to make fermented beers, wines, meads, and whattzits that will make people rave. #2 is the amazing mixologist Ellen Zachos with her book The Wildcrafted Cocktail. If you want to know how to make delicious cocktails by mixing your foraged finds with traditional hard liquors and spirits, this is the book you want. 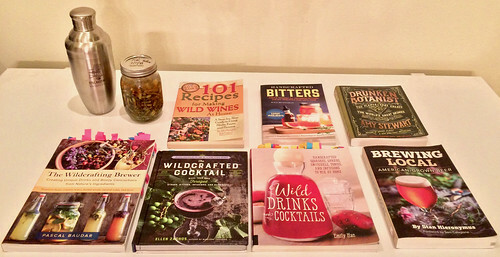 #3 is Emily Han's Wild Drinks and Cocktails, the book that started me off into the fascinating world of foraged drinks. This book covers the switchels, shrubs, and squashes which were the "cocktails" of the prohibition era. These types of drinks are being rediscovered by top-level bartenders due to their fascinating history and fantastic flavors! #4 is Stan Hieronymus's Brewing Local. I was actually one of the technical consultants on this book which covers the history of beer in North America. The early Germany settlers made beer out of damn near EVERYTHING the grew and this book tells you how you can, too! #5 is John Peragine's wonderful 101 Recipes for Making Wild Wines at Home. As much as I love beer, wine is much simpler to make and so it fits my busy life. #6 is Ken Schramm's The Complete Meadmaker (not shown in picture, lent it to friend). I have a real sweet tooth and access to honey which is good because mead is my favorite fermented drink thanks to Viking ancestors. #7 is Will Budiaman's Handcrafted Bitters. Bitters are the magic ingredient that turn a mix of alcohol and fruit juice into cocktails. There's a whole world beyond Angostura Aromatic Bitters! #8 is Amy Steweart's The Drunken Botanist which covers all the history of the plants used to make those alcoholic drinks y'all love so much. It's a hysterical and somewhat scary book when you realize where the fine line between tasty and poisonous lays!